There's something about New Orleans. It's a city like no other. The vivid colors, the scent of magnolia, music hanging in the air. It's a place filled to the brim with character and a history that highlights what makes it a unique American city. Even its architecture has a story. 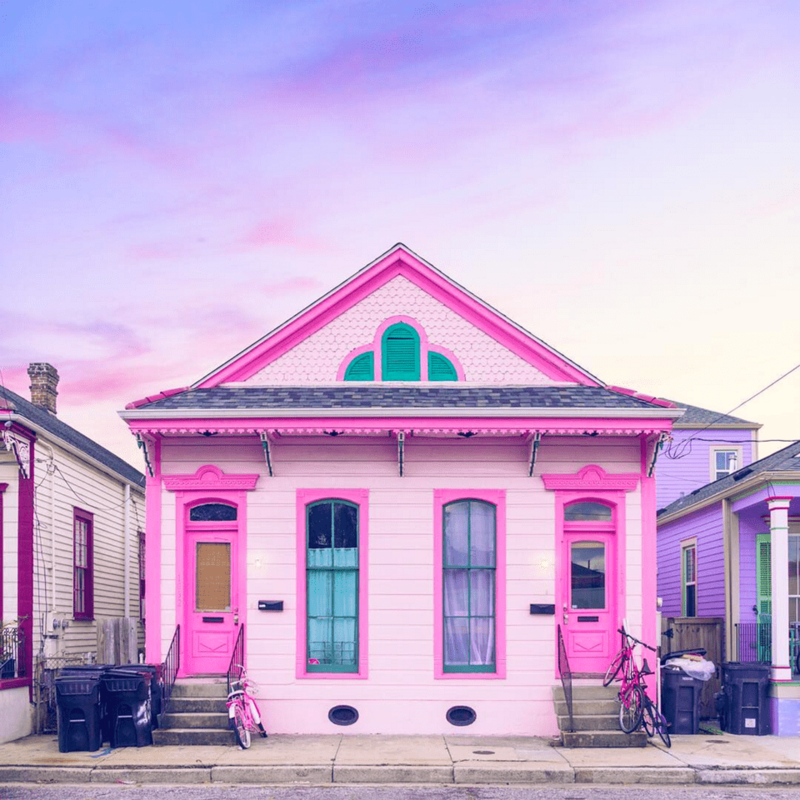 And this story can be found in this vibrant, pink shotgun house, where lifestyle bloggers, Beau Ciolino and Matt Armato of Probably This, have designed a home filled with style. The shotgun house itself has a unique history. Like everything in New Orleans, there is a cultural influence that guides the unique architecture of these spaces that are now being historically preserved. With roots that scholars believe goes back to the Yoruba people of Guinea and Angola, the homes, featuring narrow, rectangular shapes, a gable roof, and high ceilings, are a beautiful backdrop to today's modern aesthetic. For Beau and Matt, they have embraced these architectural elements in the design of their home. Some of their favorite features include the sixteen-foot wood-paneled ceilings that can be spotted in the home's living room. "They're a little beat up, yes, but they show the age of the house and add so much character. Plus, we think the wood is just gorgeous. Whenever we can, we try and add hanging plants or framed art high on the wall to draw the eye upward toward the ceiling." Just like New Orleans itself, the interior reflects a mix of cultural influences. The sofa and coffee table is mid-century modern. Above, a brass light fixture adds an industrial touch. For a splash of color, Peruvian pillows bring home shades of red, yellow, blue and green. The walls continue the cultural mix with an installation of beautiful, handwoven Tonga baskets that have roots in Zambia and Zimbabwe. The unique architecture of the shotgun house is that there are no hallways. One room flows into the next with little delineation. For Matt and Beau, they defined the space by creating rooms that have been designed to be entirely separate from each other, featuring their own unique design aesthetic. The dining room is one such space. Where the living room is primarily white with pops of color, the dining room has been painted a gorgeous pink and is a riot of hues. "We painted our dining room a wild and fun bright pink, because we wanted our dinner parties to be, well, wild and fun. We're not very uptight and we wanted to make sure the rooms reflected that." The vibrant colors make the dining room an absolute show-stopper. Pink walls, a red settee and natural woods and woven materials make this room absolutely shine in this historic New Orleans home. "While we put effort into how we designed the space, at the end of the day, everything we've done to the house is just based off of what we're loving at the time. It's always changing and we don't have any final vision we're trying to reach." That fun with experimentation shows in each and every room, where Beau and Matt have been trying out new ideas. For example, in the dining room, a play with gold frames has become an unexpected art installation. In every room in their home, these two lifestyle bloggers have mastered the art of bringing the outdoors in. In the dining room, houseplants pop against the bright pink walls. In the living room, hanging plants have been hung from the ceiling and add to the colorful mix. "Our bedroom is much less colorful. [It] has soothing grays and earth tones. While we're all about crazy fun colors, we find the simple earth tones to be more conducive to a good night's sleep." The bedroom has been designed to be a quiet retreat for the couple. A reclaimed wooden bed looks lovely hidden among the plants in the room. Simple white bedding, and a mix of art on the walls completes the relaxing feel of the space. Yet, even in this quiet bedroom design, the couple shows off their playful side as well. A wall installation of staghorn ferns blends art with the practical need for plant life at home. Their unique shape makes them a statement piece on the bedroom wall. The final note in the bedroom—the lighting. The couple, though renters, worked to fill the home with original light fixtures that add to the interior design. "We absolutely love all of the lighting we've put in. The house originally had very basic ceiling fixtures and fans, and with just a few hundred dollars we were able to replace most of those fixtures with modern brassy pieces."